Silk Purse Antiques recently moved several blocks south after a fire in the adjoining building last September forced several businesses to vacate. Owner Becky Overmyer wasn’t sure what she would do after being in the same location for 17 years. She took the winter off to spend with family and returned in the spring to occupy the space once filled by Avalon Jewelers at 275 South Main Street. The larger space has allowed her to separate antiques by sections such as horses, crystal and primitive items. The fire and water damage ruined vintage clothing and linens but most of the glassware, crystal items and furniture were salvaged. She’s still in the process of bringing additional items into her store, many of which were moved to storage after the fire. Overmyer, who grew up in Zionsville, remembers when there were more antique shops along Main Street. “I was happy to keep that going, because there aren’t too many of us now,” she said. 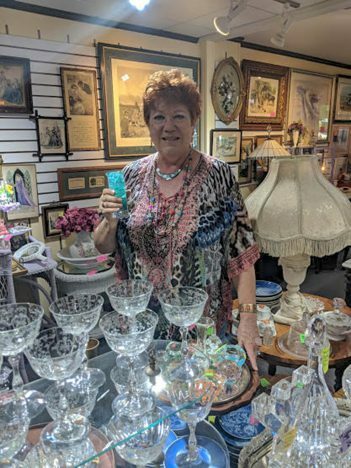 The name of her business was conceived in tribute to Robert Bender whose antique shop, The Sow’s Ear, resided in the location before Overmyer. “I made a Silk Purse out of a Sow’s Ear,” she said. She debated whether to rename the shop again with the new move. Akard True Value named best hardware store by True Value Co.